K-Meleon is a web browser with an array of customization features. You can customize the browser as per your convenience. The browser extends support for macros and these macros can be customized as per the user requirements in Macro library which provides a common ground to add, delete or create macros. It supports keyboard shortcut customization that enables you to set specific keys or combination of keys to instantly perform a function or task. This browser supports mouse gestures that help you control the navigation and is available in six different languages, including French and German. It comes with an inbuilt pop-up blocker that automatically blocks pop-ups as soon as it encounters the pop-ups; however, these pop-ups can also be allowed for some specific sites using the pop-up menu. There are a lot of themes and skins available on the browser’s official website to customize the look and feel of the software. Other features include support for Mozilla keywords, Microsoft Quick Search support, tabbed browsing, symbiotic loader integration, and many more. The software is available for devices running Windows XP and newer versions. K-Meleon is the most suitable for users who like a browser with lots of customization features. You can almost customize all of the features/functionalities of the software. The software, however, lacks a download manager and doesn't provide incognito browsing. 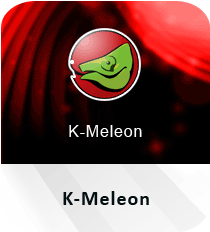 Download K-Meleon now to get your own customized version of a web browser.